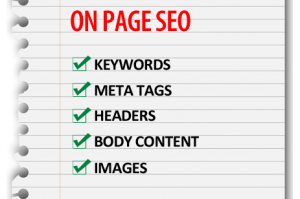 On-Page SEO (Part 2): Keyword Optimization | Thill Logistics Inc.
1) Keyword Cannibalization: Once you assign keywords to a page; do not use them for optimizing another page. You do not want your pages to be competing against each other in search engines. Take advantage of being able to optimize for other keywords! 2) Optimize for 5-10 keywords. I prefer to stay around 5. If you have more keywords you would like to rank for, create more pages that are more relevant to those keywords. Now that we have that out of the way, let’s get into the details. Below are basic steps you can take to optimize your page with keywords. I will eventually create more detailed posts on other factors, but for now these basic steps are the most critical. Meta Title: The meta title should be no longer than 70 characters and should contain at least one of your keywords (preferably the most searched keyword as long as it fits the information on the page). This example used two keywords: cheap graphic t-shirts and t-shirts for men. Meta Description: The meta description should be between 150-160 characters and should contain as many of your keywords as possible, but remember to make it readable for users as this is what they will see in search engines. Meta Keywords: These use to be a factor that search engines used but no longer have much weight to the ranking algorithms. You can still optimize this tag, but it will be viewable in your code to any of your competitors giving away your keyword strategy. If you insist on optimizing it add your 5-10 keywords to the tag. It’s important to order them from most important keyword to the least important (You will also want to apply this same rule in the meta title and meta description whenever possible). Things to remember when creating your meta tags: First, avoid duplicate meta titles, descriptions, and keywords at all cost on multiple pages since search engines hate duplicate content! Second, make the title and description readable for searchers (don’t make it sound like a computer wrote them!). Finally, relevancy is critical. The more defined your keywords are to that of the information on your page the better off you’ll be. Optimizing your header tags on your page is a good way to help your SEO. Search engines use the information found in header tags to get an idea of what your pages are about. To optimize your header tags you will want to build in your highest priority keyword into the <h1> tag (use only one h1 tag per page). If you need more than one header use additional header tags (h2, h3, h4, h5) and add your keywords to them. Remember to keep your header tags in chronological order, h1 to h5. 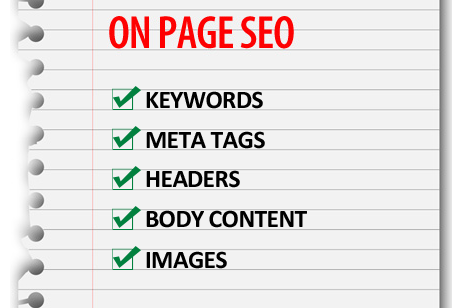 This part is quite simple; work all your keywords into the body content of the page. Try and place your most important keywords within the first couple of sentences on the page. Remember to make your content readable and use proper grammar. Search engines can now detect grammar issues on websites. Don’t over optimize the page by stuffing keywords anywhere and everywhere. Again, make it as natural as possible. This step involves making good use of your images on your pages. For each image you can easily add an “alt” (alternative) description to your images. This is where you will want to add a keyword if the keyword is relevant to the image. This will help search engines know what the image is about and help your organic search rankings. Now take these steps and apply them to your pages and look for future posts on more on-page SEO factors including internal linking, website structure & more.